With caramelized onions and semi-cured cheese, our Manchega has few rivals. For sure you have a good bakery in your neighborhood, or two, or three, with some great buns for your little creation. Go and tell Trini to give you half a dozen of those delicious homemade buns, made with sourdough starter, soft and resistant at the same time. If you prefer whole, be sure they are really made with wholemeal flour, because often the supermarkets fool us and sell buns as integral only by putting four pipes on the top. Fresh and freshly minced. Don’t use ready-made trays, because meat is the cornerstone of the hamburger. It really makes the difference if you go to the butcher´s, choose a good piece, with its fat portion, and minced it there. It would be great if you cook it grilled and medium rare, but if your neighbor complains if you do a barbecue on the balcony, prepare a hot pan or grill, with a couple oil drops, salt and pepper. Or, do the barbecue, smoke his hanged-up clothes and invite him to dinner as an apology. A tasty apology. Different strokes for different folks. Cheddar, Manchego, Mozzarella, Brie, Roquefort, Philadelphia … Any cheese matches. Try to compensate flavors to reach the climax: with soft cheese, crispy bacon. With strong or spicy, a good jam or caramelized onion. "If you do not stain your hands eating, something is wrong. Wrap it in aluminium foil or put a plate underneath if you don´t want to end up as a low cost abstract art gallery." 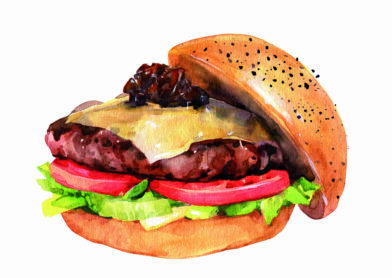 Classics never fails, and the cheeseburger Bible´s says that the base should always be under the meat and that it has to be formed by the undeniable triple: tomato, onion and lettuce. Fresh vegetables freshly cut. 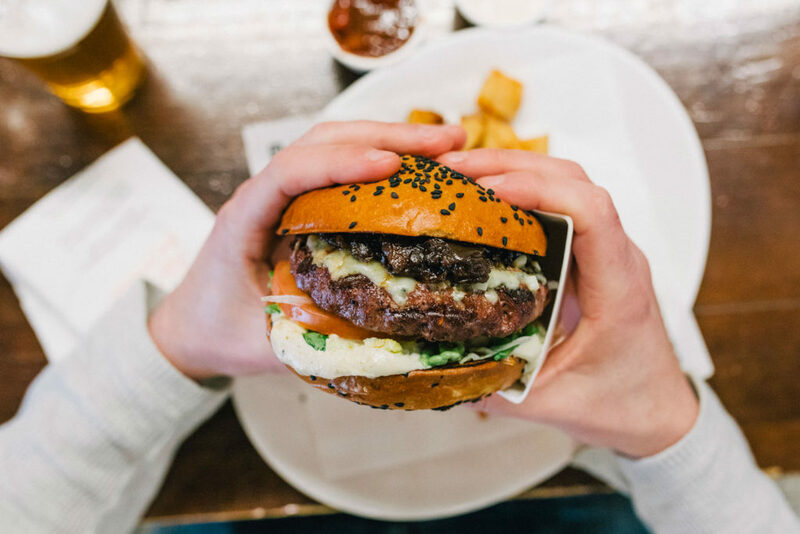 We love our burgers with a generous base of homemade mayonnaise, but, as with cheese, your creation admits any kind of sauce. Be creative, free yourself and bring out the little Jamie Oliver that you have inside: barbecue, mustard, guacamole, vinaigrette, tartar, pesto, hummus, peppers, fried egg, etc. And that’s it! You have your cheeseburger finished, served, shining bright like a glowing star, but you feel like something is missing. You´re right, burgers should always be accompanied by good fries. Psalm, 154 verse 42.